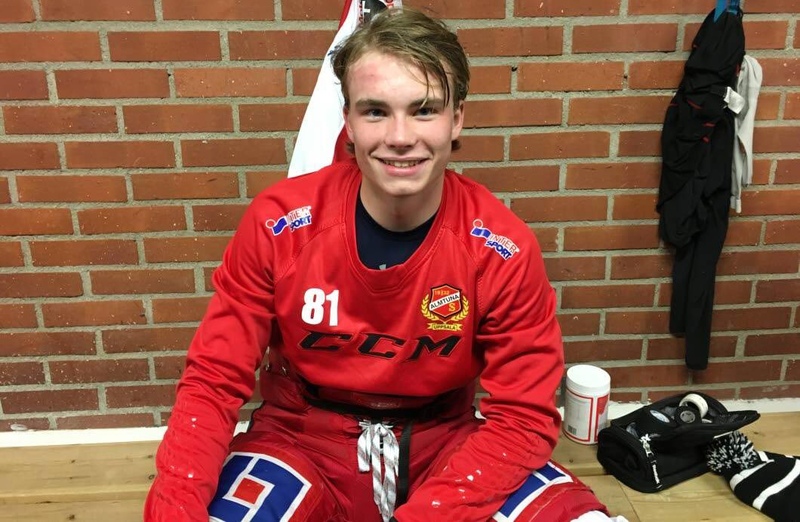 Marthinsen, 18, from Lorenskog, Norway, was a seventh round draft pick (#213 overall) by the Washington Capitals in the 2017 NHL Entry draft. Marthinsen is currently not under contract. Marthinsen is a very intriguing project. Taken in the 7th round in the 2017, many think he might be a throw away pick. But what separates Kristian from other players (besides being from Norway) is he is a pure goal scorer. In every league he’s played while over in Europe he’s had more goals than assists. That tells you he loves to shoot and score goals. Even after missing six more games than the guy in front of him, Roykas was 2nd in goals in the J20 Elit league with 23 in 23 games. The player ahead of him only had two more goals. If Marthinsen played the full season he would have easily taken the lead in goals. The funny thing about Marthinsen is he always has such low assist totals. He was 30th in points in the league, but all 29 players in front of him had at least 15 assists; Marthinsen had just 8. If he had at least 15 assists he would have bumped him form 30th in points to 13th. The following is a compilation of our month-by-month prospect reports for Kristian Roykas Marthinsen during the 2017-2018 season. Marthinsen is a very intriguing prospect because he is a pure goal scorer. He’s one of those players I love because he always has more goals than assists. That’s something the Caps need: a shooter. When he was 15, in the Norway18 league he had 24 goals and 18 assists (42 points) in 29 games played. When he was 16, in his J18 Elit league, he had 12 goals and nine assists (21 points) in 21 games. Then, between his 16 and 17-year old seasons he potted 17 goals and 11 assists (28 points) in 22 J20 Elit League games. And he currently has 11 goals and four assists (15 points) in 11 J20 Elit league games. Those 11 goals are tied with the lead for the whole league. Another way to look at it, is from 16 to 18-years old, Marthinsen scored 28 goals and 10 assists (38 points) in just 33 J20 Elit games, he just turned 18 over the summer. He’s definitely a kid to keep an eye on. I picked Marthinsen as one of my two favorite prospects last month and he continues to impress. He’s a goal-scorer through and through and continued as such in November. In 16 games so far this season, he has 17 goals and five assists. His 17 goals are three more than anyone else in the league. He also sits 12th in the league in scoring, mainly because he just doesn’t put up assists, as his assist total would indicate. All 11 players in front of him have at LEAST 11 assists. If he had at least 11 assists, he’d be third in the league in scoring. It’s unknown whether he simply doesn’t pass the puck enough, or maybe he can’t pass well. However, he has a history of scoring more goals than having assists. Marthinsen only played one game in his J20 Elit League in December so there isn’t much of an update. He did score a goal in that one game though, bringing his totals to 18 goals and five assists in 17 games. His 18 goals still lead his league by two even though he’s been absent for seven games. The reason he only played one game in his league in December is it looked like he was loaned to two other leagues but he didn’t record any points. Not too worried about it because it’s doubtful he’s getting much time. Hopefully for January he gets back to J20 and continues to dominate. Marthinsen played in just three J20 Elite games in January, but scored four goals and one assist. That brings his total in 20 games to 22 goals and six assists. That 22 goals is tied for the league lead, though the player he’s tied with has played three more games. It’s still inexplicable as to why Kristian can rack up so many goals and so few assists, but we’ll take goals over assists every day of the week. His 28 points are good enough for second on his team. Marthinsen received some excellent news last weeks when he was drafted into the CHL Import Draft by the Saskatoon Blades in the WHL. What’s even better news is that the Blades are the same team that recent 7th round pick Eric Florchuck plays for. So the Capitals will have 2 players on the same team and hopefully the same line. The WHL will be a very good league for Roykas to play in, as it will get him comfortable with the North American game. This will also make it easier to keep an eye on him as there will be better stats to comb over and even some video. European league outside the big ones, are very hard to find more in-depth stats. This entry was posted in News and tagged Caps Prospects, Kristian Roykas-Marthinsen, Luke Adomanis, Washington Capitals Prospect Report, Washington Capitals Prospects. Bookmark the permalink.